This was an interesting commission centered around Walt Whitman's poem, The Learn’d Astronomer. The lefthand white side of the piece represents the clinical environment of scientists who lecture in classrooms; or perhaps the stir-crazy scientists themselves, stuck in laboratories listening to dissertations and plotting graphs and equations. The righthand indigo side represents the open, simple yet complex, and utterly tranquil space itself and the awe that an observer has for it. The recipient of this piece was a high-level scientist. He had done research involving magpies (hence the bird featured in both sides of this piece... used to represent the recipient himself). He has a penchant for boxelder insects (note the graphical bug crawling in the bottom corner). When given this piece, the recipient noticed and delighted in the fact that there were a couple of hidden references included in the piece: 21 white/silver dots are in the initial cap 'W' (an important number, scientifically); and that is, in fact, the dark side of the moon featured (irreverant homage to Pink Floyd's, The Wall). There are other details to note as well when looking at the righthand indigo side. 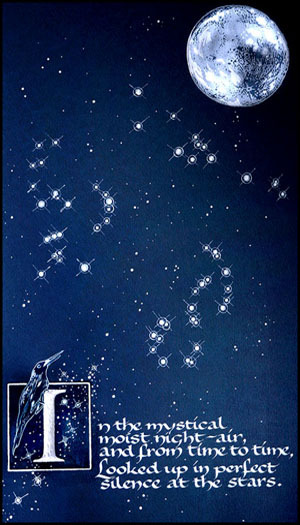 There are three constellations present: Orion, Taurus (to represent the client's astrological sign) and Sagittarius (to represent the recipient scientist's astrological sign). 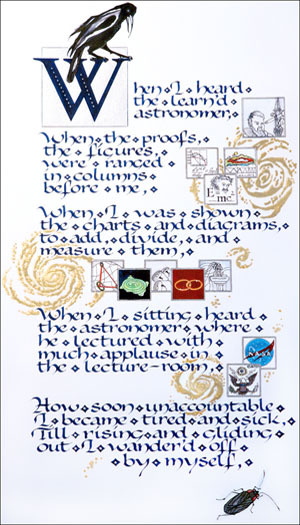 The details for the lefthand white side include icons of Galileo, Einstein, telescopes, NASA, U.S. government, covalent bonds, soundwave-ripple and infrared graphs, to point out a few.